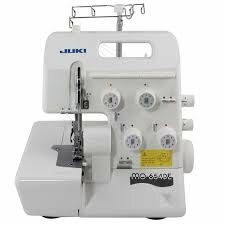 Enhance your world of sewing with the Juki MO-654DE Serger. The MO-654DE has built-in rolled hemming and performs all the popular overlock and flatlock variations. Create the latest fashion styles and home décor items sewing light to heavy weight fabrics. Add serging techniques to your world of sewing and open new doors to design opportunities! Color-Coded Threading Guides: Threading the MO-654DE is a breeze with color-coded and clearly marked thread paths. Super easy looper threading, the lower looper threader disengages for fast, easy looper threading, in seconds. Just slide the thread into the slot and snap the looper in place! This serger makes serging fun! For more information and special pricing call us at 405-495-4699.